On 5 September 2017, Belarusian president Alexander Lukashenka once again declared the need to accelerate the government’s efforts to improve legislation concerning economic embezzlement and other abuses that are slowing down the economic development of the country. Meanwhile, export are recovering briskly, although mostly due to goods based on raw materials. What’s more, the debt burden on the economy is rising, reaching a historical maximum. This is now the most significant risk to the national economy. In the first half of the year, Belarus increased its export of goods, although this is primarily due to the price factor and goods based on raw materials. The dominant exports include fuel, meat, milk and other food products, chemical products (especially potash fertilizers), and metals. Thus, the main export items comprise goods with relatively low value added. Meanwhile, on 11 July 2017, Lukashenka officially demanded that export partners be diversified, first of all to the EU market. 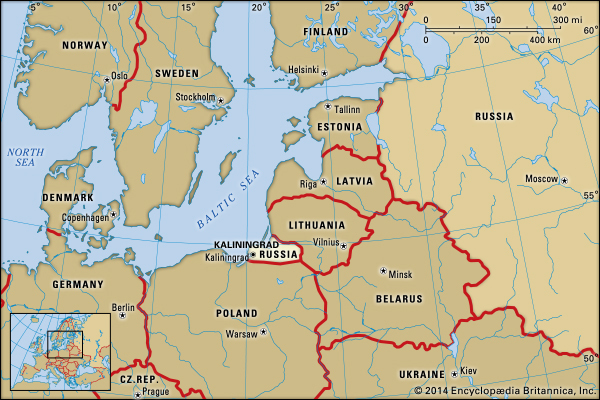 According to him, all Belarusian economic authorities and enterprises need to ‘bite’ into the European market, given its status as the most most effective and technologically advanced. 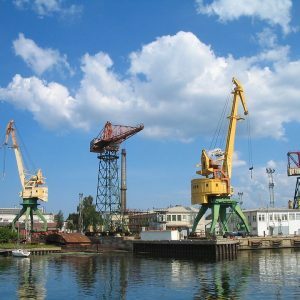 However, in the first half of the year, the share of EU countries accounted for only about a quarter of Belarusian exports. This is in stark contrast to the early 2000s, when Belarus delivered almost half of its exports to Europe. 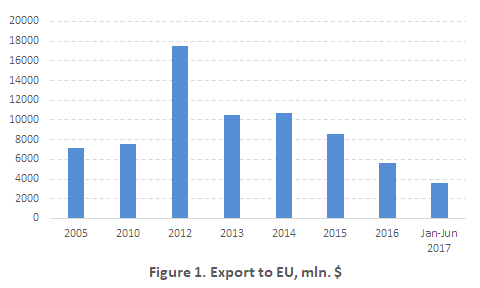 In 2012, Belarusian exports to EU countries reached a record of $17bn, primarily due to the export of petroleum products produced from duty-free Russian oil. Afterwards, disputes with Russia concerning the price of supplied oil and the redistribution of duties from oil products, along with a decline in world oil prices, has resulted in a drop of export to EU countries of approximately 67% in 2014-2016 (see Figure 1). Nevertheless, the share of raw materials in exports to the EU remains huge – approximately 80 per cent of Belarusian sales still consist of fuel, wood, chemical products, and metals. Therefore, it is evident that an increase in exports of high-tech products remains a very important task for the economy as a whole. 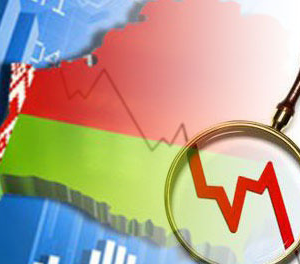 According to the President of the Mises Scientific Research Centre, Jaroslav Romanchuk, Belarus’s economy still lacks the prerequisites for increasing and diversifying its exports in the Western direction. On the contrary, economic self-isolation threatens Belarus, as competitors displace Belarusian exporters even on the Russian market. The debt burden on the economy is on the rise. The national debt relative to GDP has reached 40.4 per cent – a historical maximum. As a result, continuing with existing growth dynamics creates serious challenges for the economic development of the country. According to official data, in 1997-2006, the debt burden on the Belarusian economy remained at very low levels — external and internal debt were less than 10% of GDP. 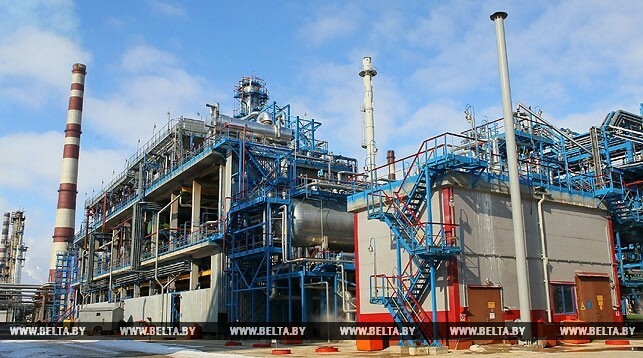 Low energy prices from Russia and the growing Russian market allowed the Belarusian economy to grow rapidly in the early 2000s without the need for additional borrowing. In 2007, however, Russia revised energy prices on oil and gas for Belarus. As a result, in order to ensure a high rate of economic growth and the stability of the exchange rate of the Belarusian Ruble, the government became actively involved in external borrowing. Thus, starting in 2007, the debt burden on the economy began to rise. From 2007 to 2012, the national debt relative to GDP increased by more than four times. Moreover, due to the devaluation of the Belarusian Ruble and the economic recession of the last two years, by the beginning of this year the national debt has grown by almost half, reaching 39.4 per cent. As a result, today the debt service costs alone for the national budget make up approximately 10 per cent of its expenditures; to repay the main part of its debt, Belarus needs keep borrowing. According to the Honorary Chairman of the Business Union of Entrepreneurs and Employers, Georgiy Badei, such dynamics will remain negative until Belarus has an acceptable rate of economic growth: to pay the debt, the economy needs to generate growth. 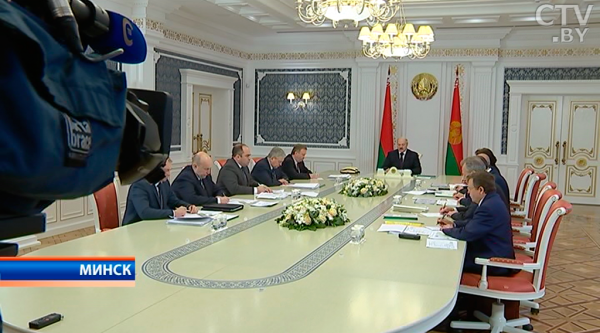 If the economy grows, the budget revenues will increase and we Belarus can begin to repay accumulated debts. At the same time, the reduction of investment in fixed capital over the past several years (such as plant machinery and equipment) does not lead to optimism regarding acceleration of growth of output and employment. Therefore, the only significant steps to be taken to liberalise the economy include reducing taxes on enterprises. This could will stimulate economic activity and help to repay accumulated debts. 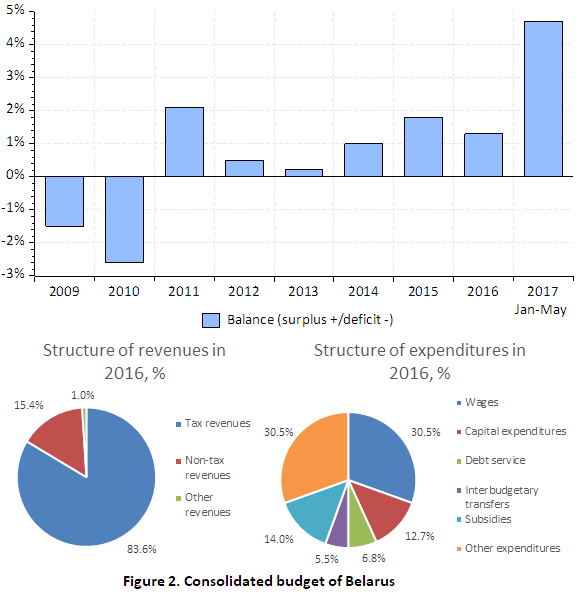 Meanwhile, the consolidated budget in Belarus has boasted a surplus since 2011, which is used for repayment of state debt (see Figure 2). The structure of revenues and expenditures of the budget has remained stable over the last eight years. However, securing a surplus is posing more and more of a challenge. In real terms, budget revenues shrank in 2015-2016 because of a recession (although revenues remain relatively stable as a share of GDP), becoming the reason for expenditure restraint from the government. In recent years, capital expenditures have decreased the most. As a result, fiscal policy has become persistently procyclical. What’s more, steady growth in social transfers has become a major instrument of the government to provide a certain level of social protection and limit the poverty level in the country. Taking together, the physical volumes of foreign trade have led to strong growth, thus helping the government fulfil budget obligations. However, debt sustainability is becoming the largest risk for the national economy.